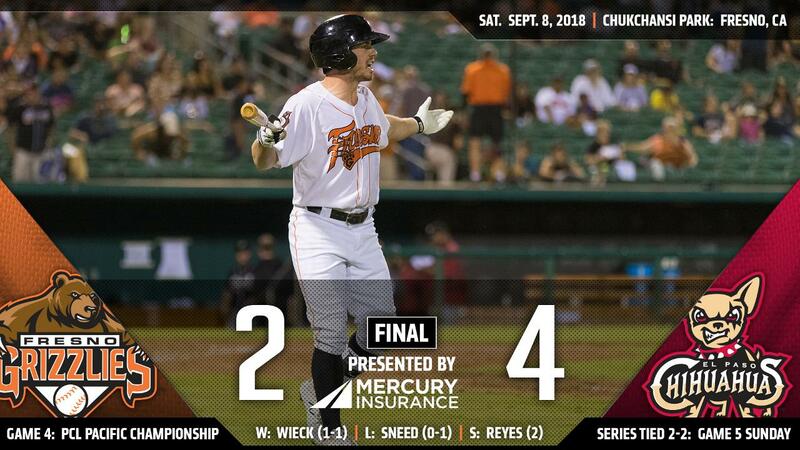 In front of a crowd of 5,116, the El Paso Chihuahuas (2-2) beat the Fresno Grizzlies (2-2) 4-2 in game four of the PCL Pacific Championship Saturday night from Chukchansi Park. With the win, the Chihuahuas sent the series to a winner-take-all game five tomorrow evening. Jack Mayfield (2-for-3) grabbed the Grizzlies a 1-0 lead in the bottom of the first when he doubled home Myles Straw. That would be the only run allowed by El Paso starter Colin Rea. The righty lasted five and one-third innings, scattering four hits, one walk and four whiffs. He would not factor in the decision. A four-run top of the seventh by the Chihuahuas put them out front 4-1. Brett Nicholas (2-for-4) spanked a single to right, adding Shane Peterson. Then, Raffy Lopez followed suit with a single himself, plating Allen Craig. Dusty Coleman ripped another single to left, making it 3-1. Finally, a fielder's choice scored Lopez, finishing the frame. Cy Sneed (0-1) suffered the loss after six and one-third innings. He was charged with three runs (earned), on four hits, one free pass and six strikeouts. Sneed had a team-best 10 wins in the regular season, the first time that a pitcher had double-digit victories since Brady Rodgers and Cesar Valdez did it in 2016. Down 4-1 in the ninth, Yordan Alvarez plastered a solo shot to deep center, inching the deficit to two. Gerardo Reyes kept it at 4-2 though, fanning one en route to his second save. Brad Wieck (1-1) enjoyed the victory after one and two-thirds frames of relief. Alvarez extended his hit streak to nine games (regular season and postseason), a current team-high. His homer was the first for him in the series. Akeem Bostick and Ralph Garza combined for four punchouts in their appearances out of the bullpen. Both squads conclude the PCL Pacific Championship series with game five Sunday evening from Chukchansi Park. First pitch is scheduled for 5:05 PT. Fresno RHP Brock Dykxhoorn (0-0, 0.00) battles El Paso fellow righty Walker Lockett (0-0, 9.64).